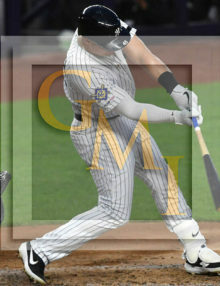 New York Yankees designated hitter, CLINT FRAZIER, hits a home run off of Boston Red Sox starter, Chris Sale, in the fourth inning. 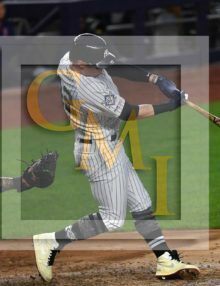 The Yankees went on to win 8-0. 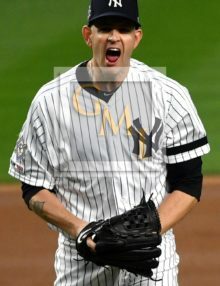 New York Yankees starting pitcher, JAMES PAXTON, celebrates striking out the side in the seventh inning against the Boston Red Sox. PAXTON recorded the strongest Yankee pitching performance of the year, allowing only 2 hits over 8 innings, no runs, 12 strikeouts, and only 1 walk leading the Yankees to a 8-0 victory over the Red Sox. 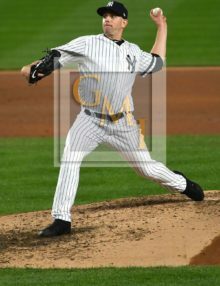 New York Yankees starting pitcher, JAMES PAXTON, strikes out Boston Red Sox second baseman Eduardo Nunez in the bottom of the seventh inning. Paxton recorded the strongest Yankee pitching performance of the year, allowing just 2 hits over 8 innings, striking out 12, walking only 1 while pitching a shutout. 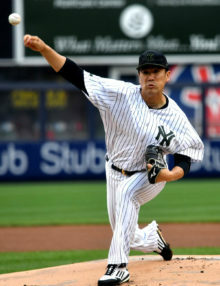 The Yankees went on to win 8-0. 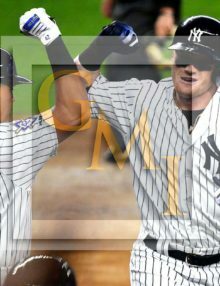 New York Yankees designated hitter, CLINT FRAZIER, celebrates hitting a home run off of Boston Red Sox starter, Chris Sale, in the bottom of the fourth inning. The Yankees went on to win 8-0. 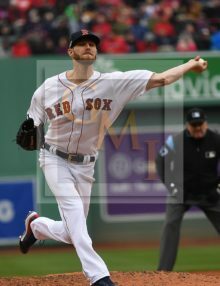 Boston Red Sox starting pitcher, CHRIS SALE, throws his first pitch of the game to New York Yankees leadoff hitter DJ LeMahieu. 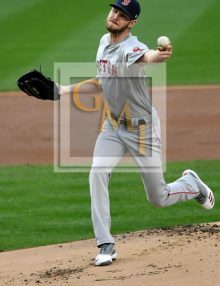 Sale recorded another poor performance, pitching 5 innings and allowing 7 hits and 4 runs as the Yankees went on to win 8-0. Sale is now 0-4, his worst start in his career. 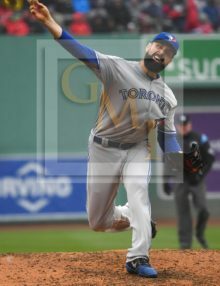 Toronto Blue Jays starting pitcher, Matt Shoemaker, strikes out Mitch Moreland in the bottom of the sixth inning. 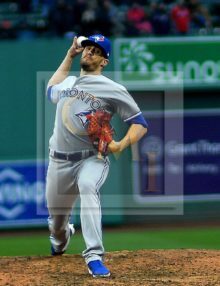 SHOEMAKER pitched 5 2/3rd innings, allowing 5 hits and three runs leading the Blue Jays to a 7-5 victory over the Boston Red Sox in Boston’s home opener. 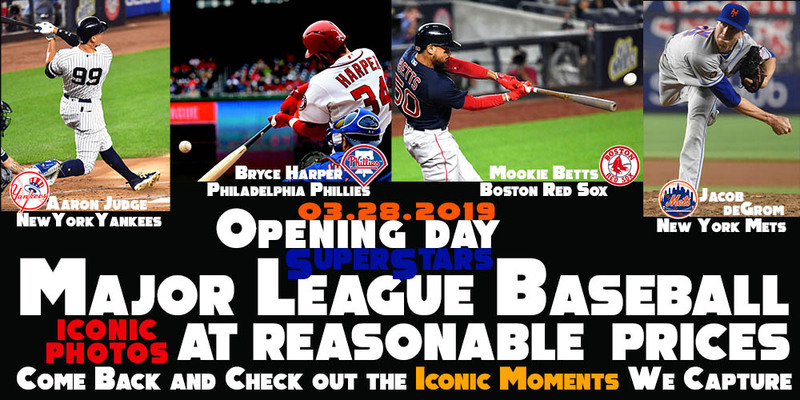 Boston Red Sox starting pitcher, CHRIS SALE , gives up a leadoff single to Toronto Blue Jays right fielder Randal Grichuk in the top of the fourth inning. The Blue Jays scored 3 runs in the inning and went on to defeat the Boston Red Sox 7-5 in Boston’s home opener. 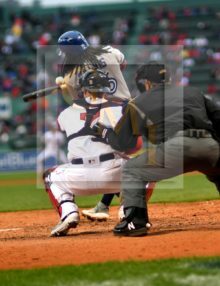 Toronto Blue Jays short stop, Freddy Galvis, hits a critical double in the 9th inning off of Red Sox closer Matt Barnes driving in Toronto’s 7th run. The Blue Jays went on to defeat the Boston Red Sox 7-5 in Boston’s home opener. 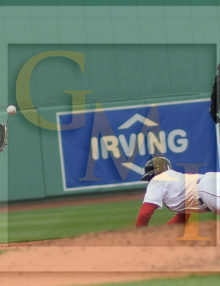 Boston Red Sox catcher, CHRISTIAN VASQUEZ, is thrown out trying to steal second base by Toronto catcher Danny Jansen in the bottom of the third inning. The Blue Jays went on to win 7-5 in Boston’s home opener. 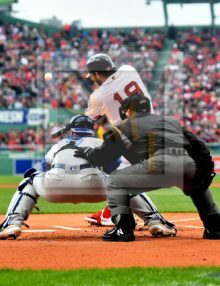 Boston Red Sox first baseman, MITCH MORELAND, hits a home run off of Toronto Blue Jays starting pitcher, MATT SHOEMAKER, in the bottom of the first inning giving the Red Sox an early 1-0 lead. The Blue Jays went on to win 7-5 in the Red Sox home opener. Nick Foles rose to the occasion defeating the greatest quarterback ever to play in the NFL, Tom Brady by a score of 41-33. Nick Foles, the backup quarterback who took over as Philadelphia’s starting quarterback only after an injury to Carson Wentz in Week 14, completed 28 of 43 passes for 373 yards and 3 touchdowns, and he even caught a touchdown pass in an offensive effort that few predicted he was capable of coming into the game. 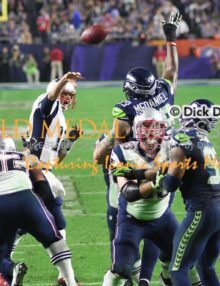 He repeatedly converted third down opportunities, threw aggressively into coverage all game, and appeared every bit as poised and confident as Brady, the five-time champion on the other side of the field. The Eagles had offensive stars all over the field, with LeGarrette Blount rushing for 90 yards and a touchdown, Corey Clement contributing 108 yards of total offense, and Nelson Agholor catching 9 passes for 84 yards. 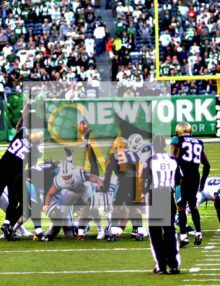 But it was Zach Ertz, Foles’s favorite target, who got the go-ahead touchdown in the fourth quarter when he dove over Devin McCourty for a thrilling 11-yard touchdown pass that stood up to a long review by the officials who were trying to determine if he had possession of the ball before it shot out of his hands in the end zone. Ertz finished the day with 7 catches for 67 yards. 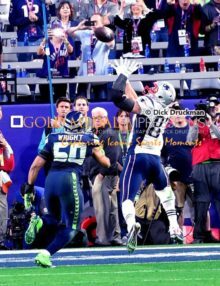 Foles is the first player in NFL history to both throw and catch a touchdown pass in a Super Bowl. 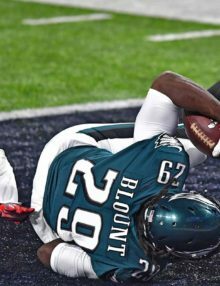 Philadelphia Eagles running back LE GARRETTE BLOUNT scores a touchdown in the second quarter giving the Eagles a 15-6 lead. The Eagles went on to win their first Super Bowl defeating the New England Patriots 41-33. 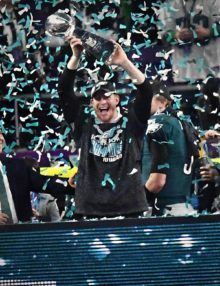 Philadelphia Eagles injured quarterback, Carson Wentz, holds up the Lombardi Trophy. The Philadelphia Eagles won their first Super Bowl defeating the New England Patriots 41-33. 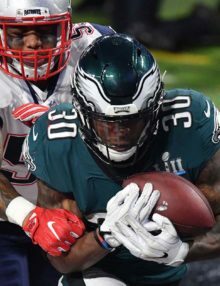 Philadelphia Eagles running back, COREY CLEMENT, scores a touchdown in the third quarter, giving the Eagles a 29-29 lead. 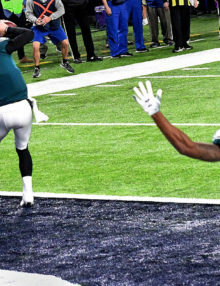 The Eagles went on to win their first Super Bowl 41-33. 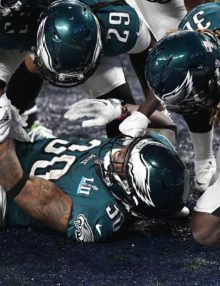 Philadelphia Eagles running back, COREY CLEMENT, is mobbed by his teammates after scoring in the third quarter giving the Eagles a 29-19 lead. The Eagles went on to win their first Super Bowl 41-33. 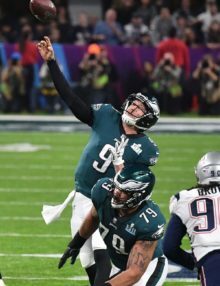 Philadelphia Eagles quarterback, NICK FOLES, completes a pass to TORREY SMITH in the third quarter of the Super Bowl. The Eagles went on to win their first Super Bowl 41-33. 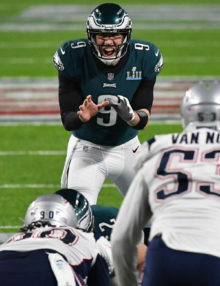 Philadelphia Eagles quarterback, NICK FOLES, barks out the signals in the third quarter of the Super Bowl at U.S.Bank Stadium. Foles completed 28 of 43 passes for 373 yards and 3 touchdowns. 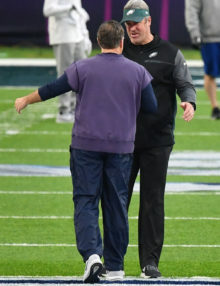 Foles led his team to their first Super Bowl victory 41-33. Doug Peterson and Nick Foles lead the Philadelphia Eagles to their first Super Bowl victory 41-33. 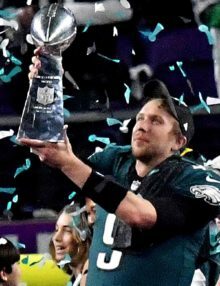 Philadelphia Eagles quarterback NICK FOLES raises the Lombardi Trophy celebrating the Eagles victory over the New England Patriots in Super Bowl LII. The Eagles defeated the Patriots 41-33, winning their first Super Bowl ever. 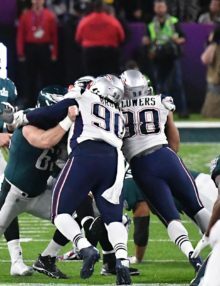 Philadelphia Eagles quarterback, NICK FOLES, passes downfield in the third quarter of Super Bowl LII. FOLES completed 28 of 43 passes for 373 yards and three touchdown. The Eagles went on to win 41-33, their first Super Bowl win ever.